The Honda Jazz’s aerodynamic and sporty design is a star attraction at Mekor Honda Cape Town. 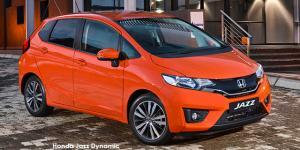 The Honda Jazz dons a 4-speaker audio system and a reverse-view camera, standard across all variants. The 7-inch multi-information touchscreen display (available in the VX variant) enables easy-to-read visual information. The Honda Jazz is available in either a 1.2L i-VTEC petrol engine or a 1.5L i-DTEC diesel engine, each offering impressive power along with fuel efficiency. Visit Mekor Honda at Mekor Honda Cape Town to get a reliable, safe and sporty Honda Jazz at an affordable price.